NMC Recordings, the major contemporary classical music label , recently announced Antonis Hatzinikolaou’s new CD release. This recital takes its title from another major guitar work of the 20th century, Nicholas Maw’s Music of Memory – an intricate set of variations on a theme from Mendelssohn’s String Quartet in A minor. It is coupled with premiere recordings of Maw’s Little Suite for Guitar; Peter Racine Fricker’s dramatic, Spanish-inflected Paseo, commissioned by Julian Bream, but never recorded; and works by Bayan Northcott, John McCabe and Joseph Atkins. Finally, the recording features two new works commissioned by Antonis from Charlotte Bray and Matthew Taylor, with support from the Britten-Pears Foundation. 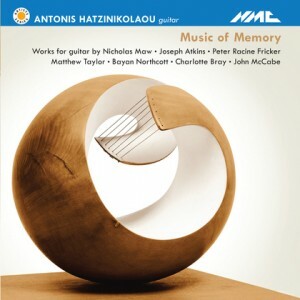 The album Music of Memory will be available from the 8th of April 2013 . You can listen to extracts here.